Blue Earth Diagnostics opens new headquarters in Oxford. Expanded facility positions the company for future growth. 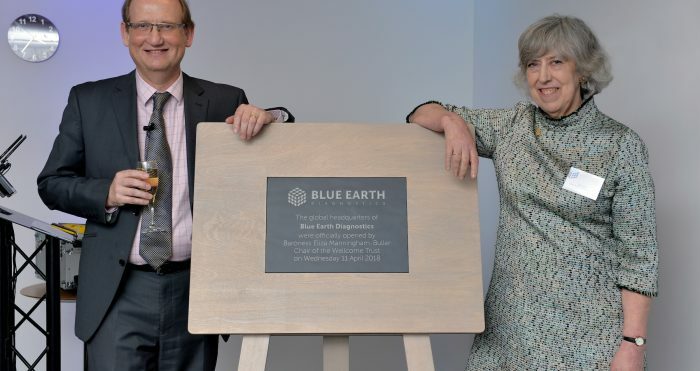 OXFORD, April 13, UK –, 2018 –Blue Earth Diagnostics, a leading molecular imaging diagnostics company, today announced the opening of its new, expanded global headquarters at The Oxford Science Park in Oxford, UK. The new offices, which will employ over 20 scientists, physicians and support staff, were officially opened by Baroness Manningham-Buller, Chair of the Wellcome Trust, in the presence of Professor Sir John Bell, Regius Professor of Medicine at the University of Oxford and Sir William Castell, former chairman of the Wellcome Trust. Following the opening ceremony, guests from the UK’s life sciences and medical imaging community were invited to tour the new offices and learn about the extraordinary potential for molecular imaging to transform the care of patients with cancer. Blue Earth Diagnostics’ new facility is equipped with state-of-the-art medical image review software and workstations which will drive the development of new technologies for molecular imaging in diseases such as glioma and prostate cancer. Eliza Manningham-Buller said, “It’s a pleasure to see how Wellcome Trust investment in Syncona has allowed Blue Earth Diagnostics to develop from a fledgling start-up to a successful company”. Blue Earth Diagnostics, which was founded in 2014 and is backed by Syncona Limited (LSE: SYNC), has developed a molecular imaging agent which is already approved for use in men with suspected recurrent prostate cancer in Europe and the USA. The company also has offices in Boston, Mass, USA. molecular imaging agent approved in the United States and the European Union for use in PET imaging to detect and localize prostate cancer in men experiencing suspected biochemical recurrence. The Company is backed by Syncona Limited, a healthcare company listed on the London Stock Exchange (LON: SYNC). For more information, visit: www.blueearthdiagnostics.com. This press release is intended to provide information about Blue Earth Diagnostics’ business in Europe.